After finishing the 2014 season 35-1 and running the table in the conference, Wichita State earned a one-seed to the dismay of mid-major haters around the country. The Shockers drew the No. 8 Kentucky in the Round of 32, losing after a potential Fred VanVleet three-pointer clanked off the iron. Earlier in the tournament, Kevin Canevari hit the greatest Nae Nae of all time after Mercer handed Duke a second-round loss. But for all of the celebration and laud for the underdogs who defy the odds to advance, there is the other side of the gauntlet – the teams who fell way short of expectations. Kansas, Villanova, and Virginia were also teams last year that did not advance as far as their seeds would have suggested after bowing out to Stanford, UConn, and Michigan State, respectively. 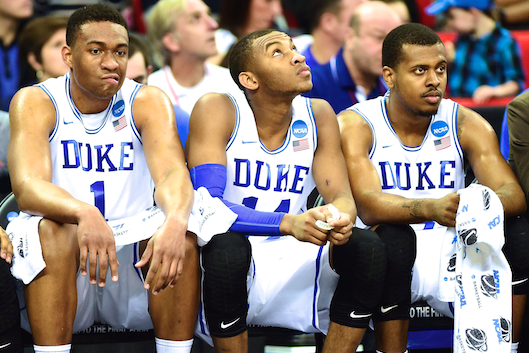 Now, these five teams are suiting up to make another run after last year’s disappointments. Will they play with a chip on their shoulders, or is last year’s pain a thing of the past? Using this methodology, there were 43 teams that underperformed by at least 1.2 games over the past thirteen years. Eight of those teams did not make the tournament the next year, and eight returned but did not earn higher than a seven seed and were thrown out of the analysis, leaving 27 teams who were upset and returned with at least a six seed the next year. Of these 27 teams, 10 teams exceeded their expectations while 17 once again fell short, implying that these teams don’t merely not play better after being upset, but are actually once again susceptible to an early round exit. The Proportion T-Test P-Value to see if teams fall short more after falling short the year before is .17, not small enough to be significant but still small enough to merit some attention. This doesn’t exactly create the clearest picture, as some teams only barely exceeded or fell short of their seeding’s average performance. Fifteen teams fell within a game of their expectation. Only looking at teams that did not fall close to expectation (i.e. 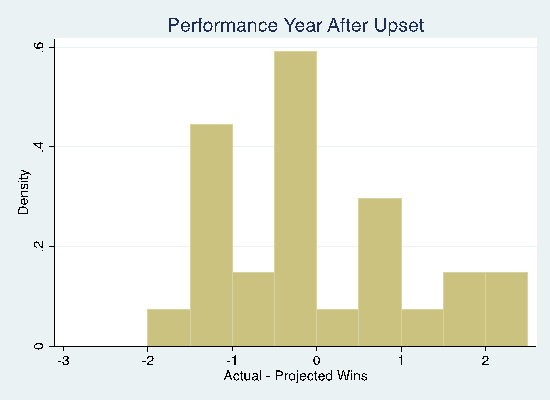 the absolute value of the difference between actual and projected wins is greater than one), five teams overperformed (twice Ohio State and twice Duke) and seven teams underperformed. Again, this is a pretty startling trend, even if it is not significant; teams don’t seem to be learning from last year’s misfortunes. One thing is clear: teams don’t perform better after experiencing March devastation the year before. If anything, the bad luck only continues.